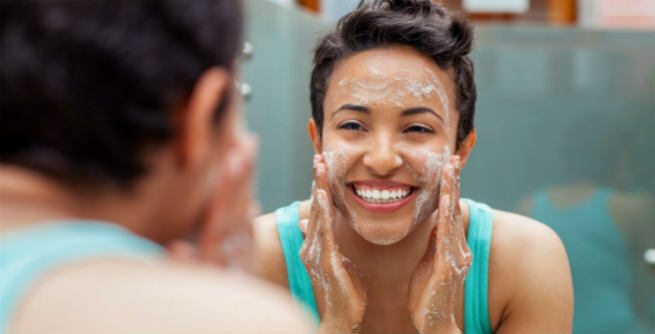 Bar Soap or Liquid Soap – Which to Use for Washing Face? Bar Soap Vs. Liquid Soap – Which One Should Be Used for Washing Face? The normal pH of our skin is considerably low, which makes it a little acidic by nature. On the other hand, the pH of most of the commercial bar facial soaps is much higher than that of our skin, which turns them alkaline. It means, if you use a bar soap regularly for washing your face, you will end up disturbing the normal pH balance of your skin. As the pH of a bar soap is significantly high, it takes a toll on the natural barrier functions of our skin. In other words, frequent use of a bar soap for washing the face can hurt the natural protective power of our skin cells and make the surface even drier by letting the water evaporate from it faster. As a result, your oily or normal skin will become dry and dry skin will turn extremely rough or damaged. Usually, bar soaps lather extremely well and that too with larger bubbles. It makes them excessively harsh on the skin, thereby making the skin dehydrated, tight and parched both physically as well as visually. Studies have proved that acne-causing microbes develop and grow significantly in an alkaline environment. As bar facial soaps are alkaline by nature, they can actually play a key role in promoting the intensification of such bacteria and worsen the condition of an acne-prone skin by increasing breakouts. The pH of liquid soaps is much lower than that of bar soaps and we can consider it almost similar to the skin pH. Hence, the skin doesn’t get affected due to pH imbalance. Liquid soaps are known for their better as well as gentler formulations, which do not dry out our skin upon every single use. Therefore, there is lesser chance of getting a tight and parched feeling. Liquid soaps do not lather that well like regular bar soaps. It makes them comparatively less dehydrating. Being less alkaline, liquid soaps do not encourage the growth of bacteria in our skin, thereby reducing the possibilities of breakouts to a large extent. In summary, liquid soaps are quite better than sulfate-rich bar soaps for washing the delicate skin of our face. However, if you still need to use facial bars for some reasons, try to find a non-alkaline one that is gentle on your skin and also nondrying at the same time. You can opt for something containing vegetable oil, milk, shea butter, etc. Using deodorant soap on your facial skin is a big no-no.